New Orleans music festival Voodoo Music Experience returns this year Halloween weekend from October 30 – November 1. 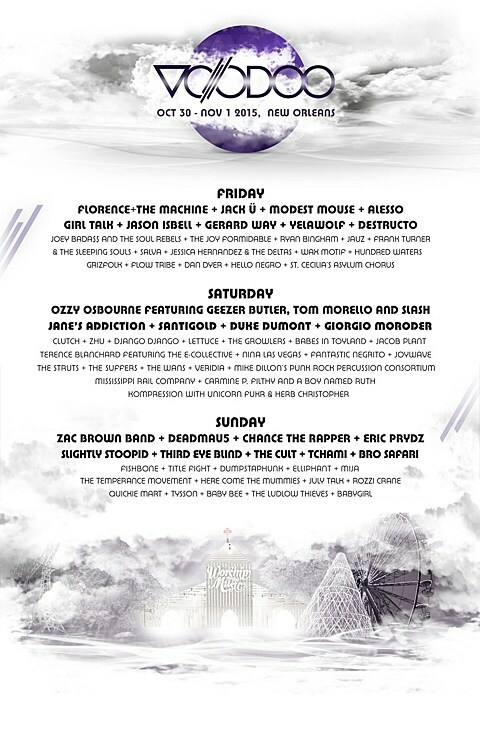 The lineup includes Ozzy Osbourne ft. Geezer Butler, Tom Morello & Slash, Jane’s Addiction, Modest Mouse, Giorgio Moroder, Chance the Rapper, Florence + the Machine, Babes In Toyland, Jack U (aka Diplo & Skrillex), Gerard Way, Joey Bada$$ & the Soul Rebels, Clutch, The Cult, Fishbone, Title Fight, Duke Dumont, Santigold, Frank Turner, Girl Talk, Hundred Waters, Deadmau5, Third Eye Blind and more. Tickets are on sale now.